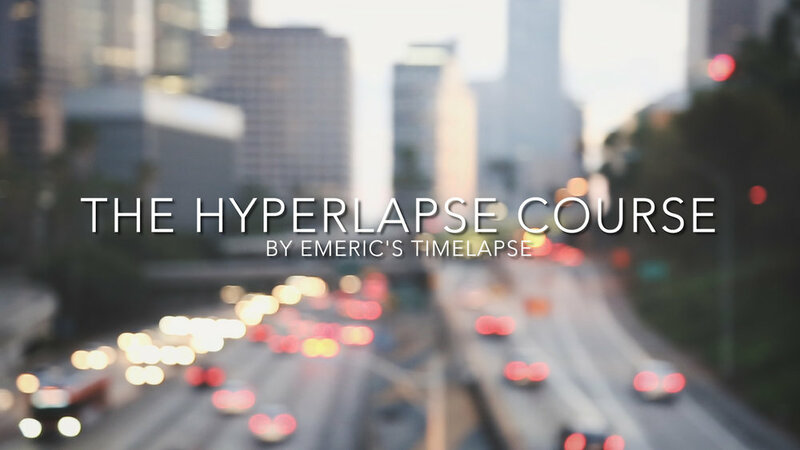 Emeric's Timelapse Complete Training package includes the Timelapse Master Class 2017, the Holy Grail Day to Night Timelapse Course and the complete Hyperlapse Course for 20% off the total price of the 3 courses. Emeric's Timelapse Complete Training package includes the 3 courses with more than 5 hours and 40 minutes of lessons in 40 videos 100% in english. It's perfect for anyone who wants to go from beginner to expert in the timelapse and hyperlapse industry! We are covering every type of timelapse, from day to day to milky way timelapses. We are also teaching you how to create amazing and beautiful day to night "Holy Grail" timelapses where you have to change the settings while the camera is taking the pictures. Night to night timelapses are also included in this course. The last tutorial teaches you how to use a Revolve Camera motorized slider to create amazing motion controlled timelapse. We are giving you one timelapse raw sequence for the Milky Way tutorial, so you can practice at home if you don't have access to an area to shoot the Milky Way! - 17 instructional videos to learn how to shoot and stabilize Day, Night and Day to Night Hyperlapses. - A raw images sequence of 300 photos of the Milky Way Timelapse to practice in the same time you are watching the tutorial. Here is a quick intro of the art of day to night timelapse, also called "Holy Grail". It is harder as you have to change your camera settings as you go, but Emeric has some really cool tricks on that! We work on our first timelapse shot with the Revolve Slider and learn how to retouch it and show you more examples of Motion Controlled timelapses that Emeric shot with the slider. In this video, we show you a more advanced way to stabilize your timelapse if the Warp Stabilizer effect didn't do a good job. 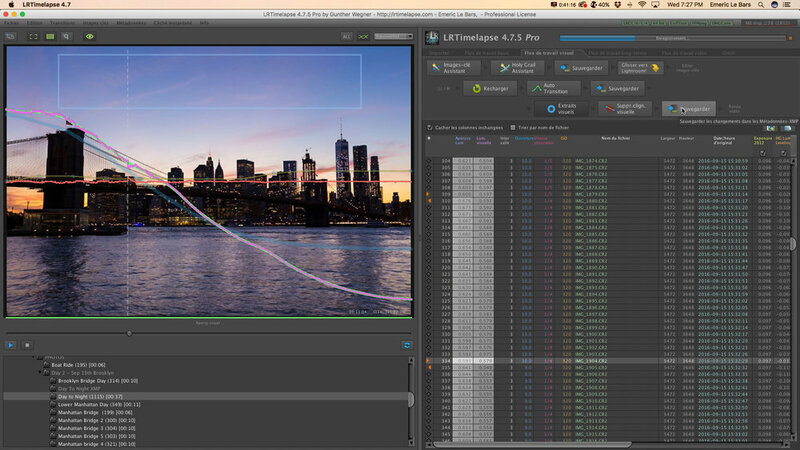 This time we are using the Tracking Mode in After Effects. It's time to say good bye and thank you for following our adventures! See you soon! - A raw images sequence of 150 photos of the Day Hyperlapse to practice in the same time you are watching the tutorial. The Day to Night Timelapse Course is the best way to learn Holy Grail timelapses. Shooting and editing day to night is not easy because of the exposure change between the day and the night. In this course, I teach you everything you need to know from the pre-production to the post-production. 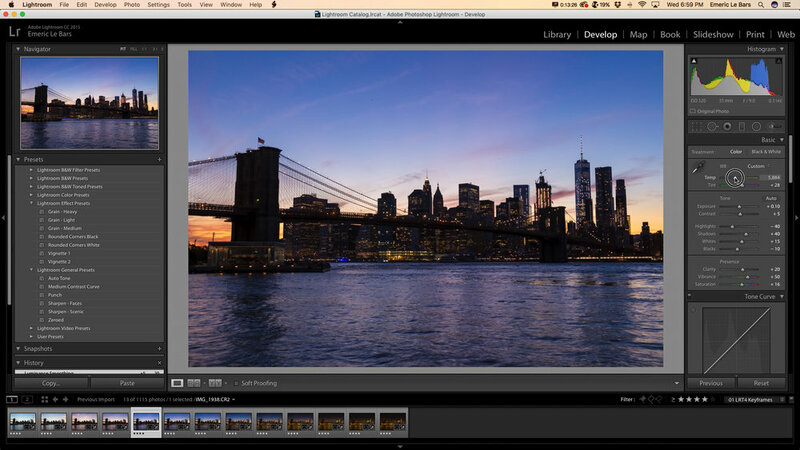 You will learn everything about the settings and how to shoot them on location, but also how to properly edit them using LRTimelapse and Lightroom to end up with a flicker free video. In this 1 hour and 20 minute course, divided into 13 videos and 3 main parts, I give you so much information on how to shoot, edit and color correct those kind of timelapses to end up with a flicker free video. 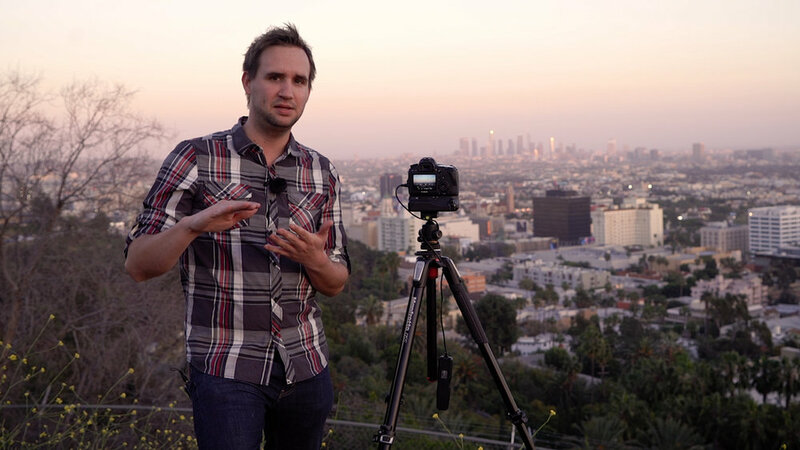 - 13 instructional videos to learn how to shoot and edit Holy Grail Day to Night Timelapses. 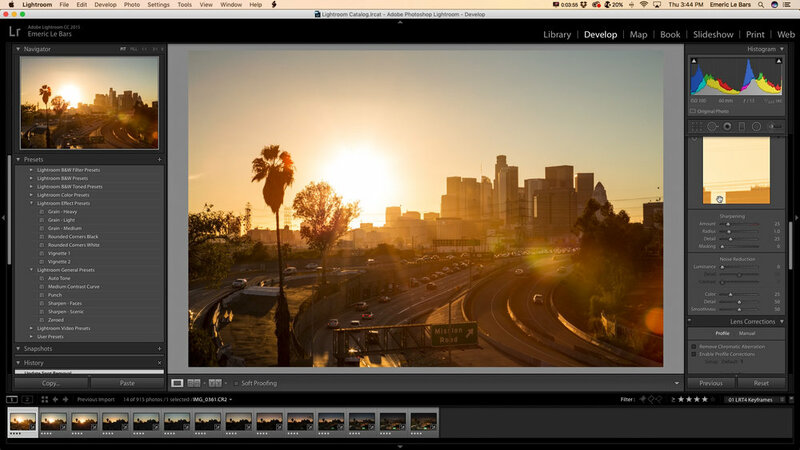 - A Raw sequence of 457 photos of the Downtown Los Angeles Sunset to practice in the same time you are watching the tutorial. - A personal support in case you have any issues ou questions regarding Holy Grail Timelapses. In this quick video, I introduce the 3 different parts of this course from the pre-production to the post-production, including the production. The pre-production is very important. You need the correct gear and accessories to shoot a 2 or 3 hours long timelapse. I also explain how to chose a good subject because it has to be interesting from day to night. Knowing when to start a Holy Grail to catch the Golden Hour light is also important and I give you some tips in this video about this matter. The production is probably the most important part in this course. I give you tons of informations about my settings at the beginning, my interval and how to change the settings, what we call the ramping. 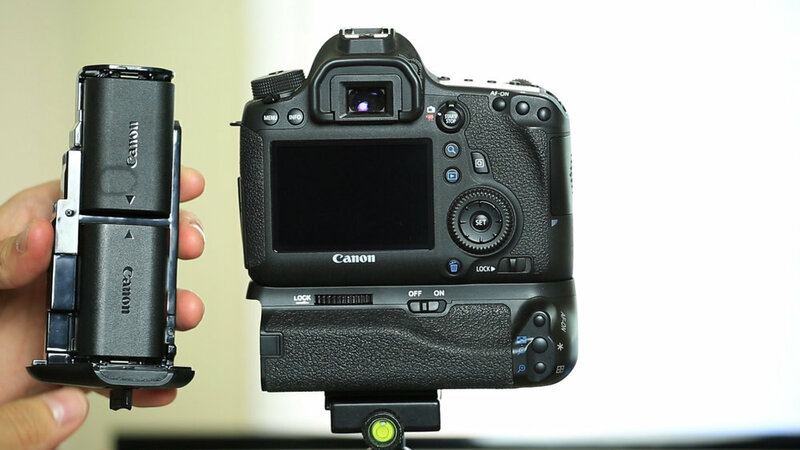 I show you live how I change the settings on my Canon 6D. I introduce the 3 types of Holy Grail Timelapses that we are going to edit and color correct using LRTimelapse and Lightroom. Note: After a SD card issue, I won't be able to work on the timelapse I shot in video 3 "Production". But it's not a big deal, I have plenty of amazing and beautiful day to night timelapses we can use for this tutorial. 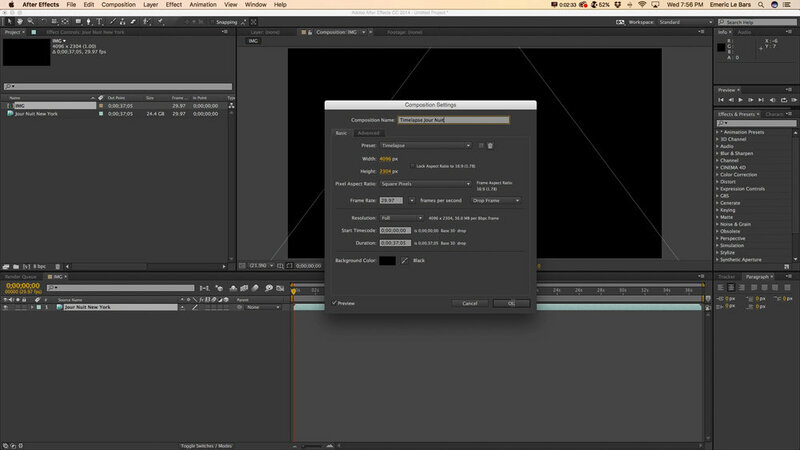 In this first post-production video, I show you LRTimelapse and the Holy Grail Wizard. It's an amazing tool to remove the flicker caused by the difference of exposure during the day to night. It's important to know how to use it to get a flicker free timelapse videos at the end. I import my photos in Lightroom and show you how to get some nice colors and contrast from day to night. 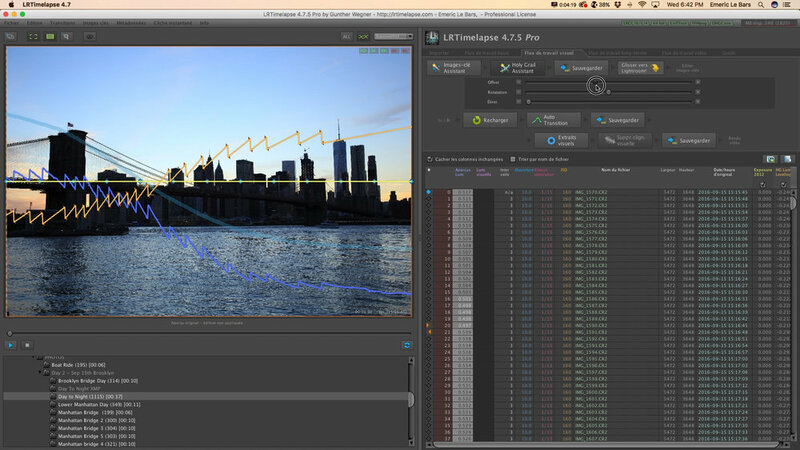 I go back to LRTimelapse to create the Visual Preview and use the Visual Deflicker. Sometimes, even after using the Holy Grail Wizard, you can have some flickering left, so it's important to know how to correctly use the Visual Deflicker tool. 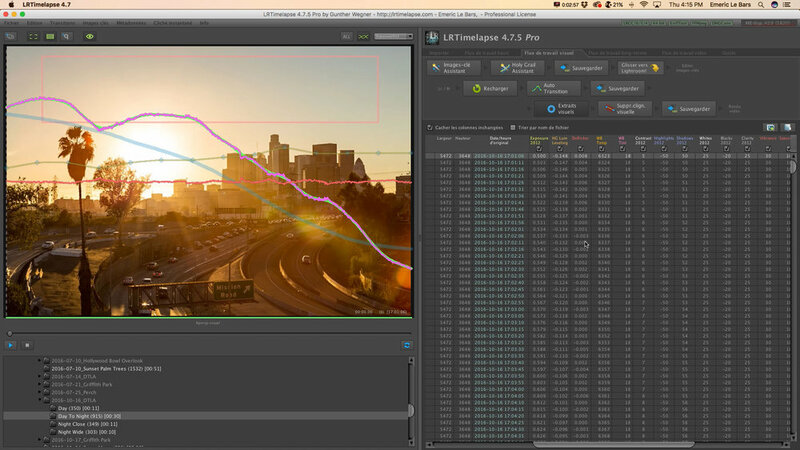 I teach you how to use it by selecting an area of your timelapse with smooth light transition. Our timelapse is now ready to be created. 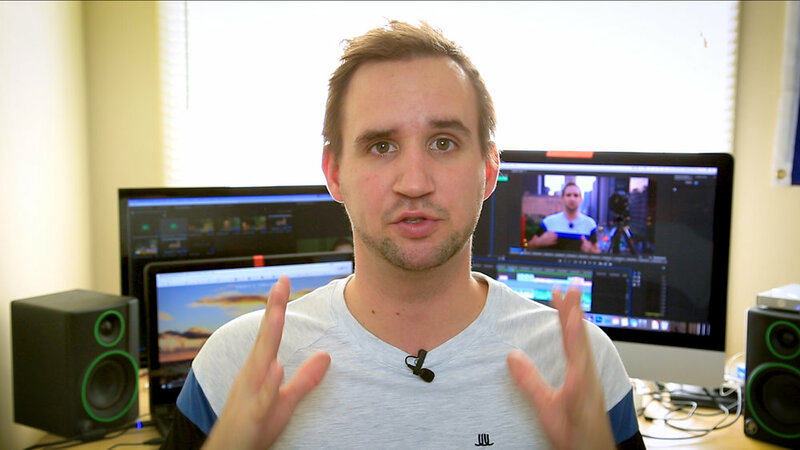 I teach you how to create the final video from your sequence using 2 different ways. The first one using only LRTimelapse and Lightroom and the second one with After Effects. Having the sun in your shot change a lot of things. This is why I decided to include the post-production of one of those timelapses where the sun sets in my shot. I had some issues during the shoot because my foreground became very very dark. 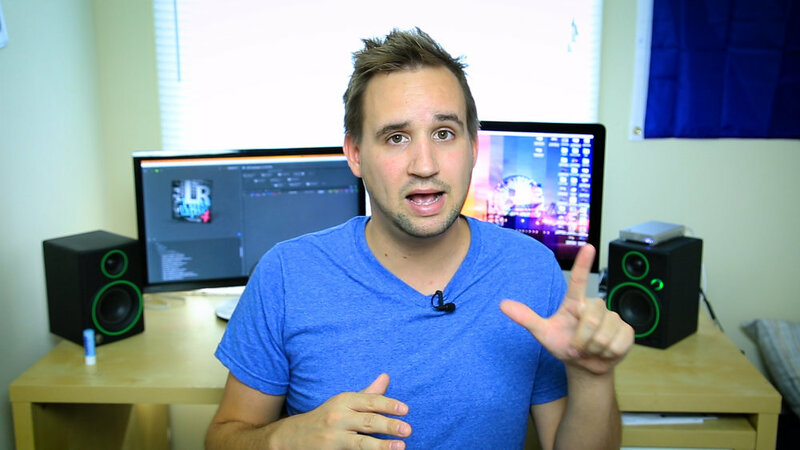 I am going to show how to fix that using Lightroom to end up with a not too grainy video. 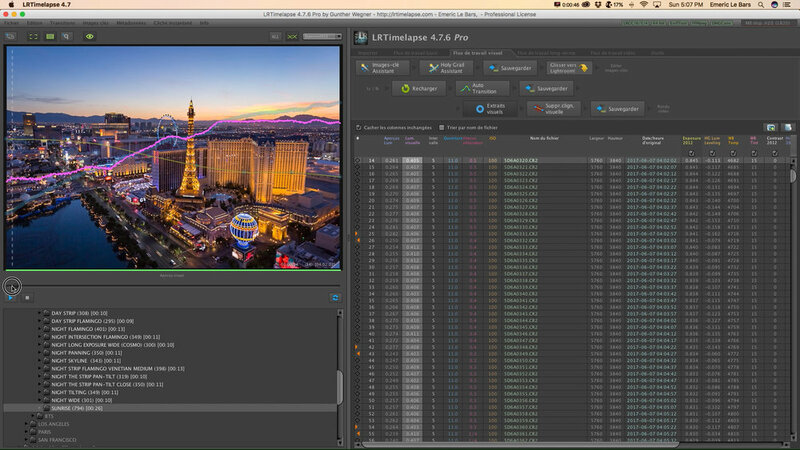 One more time, I create the Visual Preview and use the Visual Deflicker of LRTimelapse to remove the remaining flickering. It's important to know how to use this tool, that's why I am showing you a second time with a different timelapse. Sunrises are a little different that sunsets. In this video, I show you what settings I used to shoot this beautiful sunrise and why I decided to change only the shutter speed and not the aperture or ISO. Then we edit it and color correct it using LRTimelapse and Lightroom! Finally, I am using LRTimelapse to do the Visual Deflicker. This time I use the entire image instead of a specific area. In this last video, I am talking about 5 mistakes you should avoid doing during a day to night timelapse. It's based on all the questions and comments I received on Facebook, Youtube and Instragram about those kind of timelapses.